NIGERIA Customs Service, NCS, Seme Command has generated the sum of N575.6 million as revenue in the month of July 2018, even as the Command seized 2,000 cartoons of spice gin within the period. This is even as the Zone C Federal Operation Unit, FOU of the Nigerian Customs Service said it has seized contraband worth N500 million between February and August this year even as it vowed it would continue to put measures in place to check the activities of smugglers and their collaborators in the country. 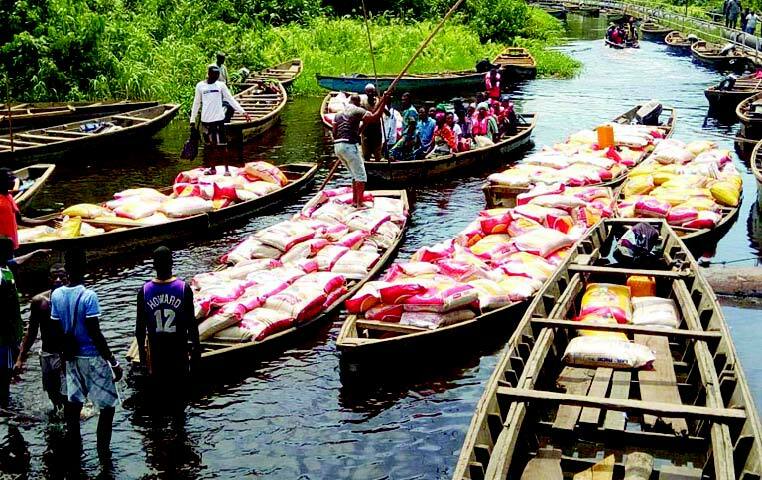 RAID: The Roving Unit of the Federal Operations Unit, Zone A recently raided Iddo and Totowu creeks both in Lagos where they impounded over 1,500 bags of imported rice. Pix shows some of the smuggled rice being conveyed on wooden canoes. The Customs Area Controller, CAC, Compt. Aliyu Mohammed, said that the antismuggling operation of the Command also made 91 seizures with a Duty Paid Value, DPV of N130.9 million during the same period under review. Mohammed expressed satisfaction over the figure collected disclosing that the revenue represented about 85 per cent of the target budgeted for the Command. He noted that seizure of Fire Spice Gin was as a result of the 42 percent concentrate of alcohol content. Over 2,000 cartons of the said item was found concealed in a truck with the intention of evading Customs control. A statement signed by the Public Relations officer of the Command, Saidu Nuruddeen Abdullahi, gave DPV of the seized item as over N13million. While restating the commitment of Customs officers of the Command to securing the border against illicit trade that is harmful to the health and wellbeing of the citizenry, he further assured that “the Joint Border Post will serve as a platform that will simplifyCustoms procedures while increasing cooperation, collaboration, coordination and harmonious working relationships at the border post. Deputy Comptroller, DC and National Coordinator, CGsStrike Force, DC Abdulahi Kirawa stated this in Benin City, Edo state when he presented seized contrabands to newsmen. He said the seized items included over five thousand 50Kg parboiled bags of rice, concealed in Elephant bags, twenty one vehicles, One thousand, eight hundred used tyres , one hundred and twenty five bales of used Clothes and foot Wears, bags of Cannabis Sativa sealed in a salon car.